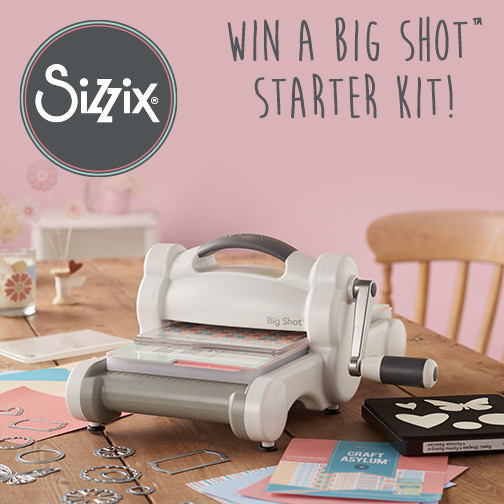 The new Big Shot™ Starter Kit has been released and in association with our Sizzix bloggers, now you have the chance to WIN one of your very own! This kit is perfect for all experienced makers and those starting out in the creative world as it suits all abilities and has an abundance of project possibilities! The Big Shot™ is able to cut a variety of materials from paper, card, fabric, felt, cork (just to name a few) and with a selection of Dies, Embossing folder and fun 5.5” x 6” paper designed by Craft Asylum® you can start creating straight away! By entering this competition you will automatically be signed up to the Sizzix.co.uk newsletter so you can be the first to hear the latest news, views and more! your e-mail adress and the other details. Днес имам страхотна новина за вас. И наградата е - Стартовия пакет на Big Shot. Единственото нещо, което трябва да направите, за да спечелите тази чисто нова машина е да въведете своето име и имейл ето тук и имате шанс да спечелите. Краен срок 6 ноември 2015г.